I invented this bundt cake recently for my sons and a bunch of their friends. We were having a sleepover and I wanted something easy and quick to serve for breakfast the next morning (we had an early outing planned and I knew it would be a mad dash for all). I baked the cake on Saturday, wrapped it tightly in plastic wrap (after it cooled) and then served it bright and early the next day. If you plan to do the same, sift the confectioners’ sugar over the top just before serving. It’s an amazing treat for kids and adults alike. Keep this recipe in your back pocket this winter – it’s an excellent breakfast or brunch for visiting house-guests and it makes a fabulous hostess gift for a holiday party. Your friends will like knowing that it’s a lightened-up cake, made healthier by using low-fat yogurt instead of sour cream and light butter instead of regular butter or margarine. 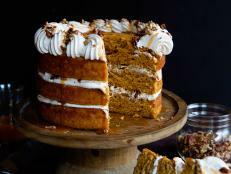 To jazz things up, you can also add 1/2 cup chopped walnuts or pecans to the cinnamon-sugar, swirl layer. Preheat the oven to 400 degrees. 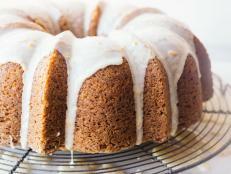 Coat a 10-inch bundt pan with cooking spray. In a medium bowl, combine the flour, baking soda and baking powder. Set aside. In a small bowl, combine 1/4 cup of the granulated sugar and cinnamon. Mix well and set aside. In a mixing bowl, beat together remaining 1 1/2 cups of the sugar with the eggs until blended and smooth. Beat in yogurt, melted butter and vanilla until smooth and creamy. Add the flour mixture and mix until just blended. Pour half of the batter into the prepared pan. Sprinkle the cinnamon and sugar mixture over the batter. Top with remaining batter and smooth the top. Bake 8 minutes. Reduce the oven temperature to 350 degrees and bake 30-35 more minutes, until a wooden pick comes out clean. Cool cake, in pan, on a wire rack. 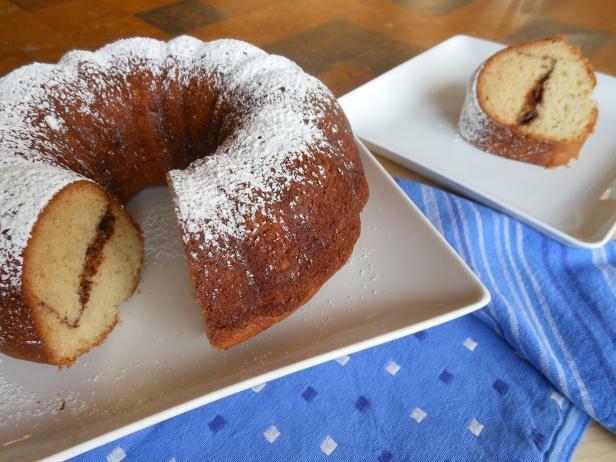 Invert cake onto a serving plate and sift confectioners’ sugar over top.